Today is Latina Equal Pay Day, the day in the year when Latina pay catches up to that of white, non-Hispanic men. That means Latinas work nearly 23 months to make what white, non-Hispanic men earn in one year. More than 50 years after the passage of the Equal Pay Act, women still get paid less for the same work. But women of color—Latinas especially—experience the widest wage gap for the same jobs. While it’s shameful that women are still fighting for equal pay, there are steps we can take to close the gap. The best way is to join a union. Through union contracts, women have closed the wage gap and received higher pay and better benefits. In fact, union women earn $231 more a week than women who don’t have a union voice. When women are represented by unions and negotiate together, they have the power to create a better life. Check out some facts below about Latina Equal Pay Day, and learn more from AFL-CIO Secretary-Treasurer Liz Shuler here. Latinas get paid only 53 cents to every dollar a white, non-Hispanic man makes—the largest gap in the nation. Latinas must work 23 months to earn what a white man does in 12 months. The average weekly earnings for Latinas is $621, compared to the $815 that white, non-Hispanic women bring home every week. Latinas in unions earn 48% more. This blog was originally published by the AFL-CIO on November 1, 2018. Reprinted with permission. Lyft has produced its first-ever diversity report, months after its chief competitor Uber released its own data about the make-up of its staff. While its numbers ring similar to other tech companies—which are predominantly white and male?—?Lyft does have more female employees than Uber. Overall, 42 percent of Lyft’s employees identify as women, compared to Uber’s 36 percent. Lyft, however, is more white than Uber with 63 percent white employees opposed to Uber’s 49 percent. Uber bested Lyft by having a better representation of Asian, black, and Latinx employees overall, with 30 percent, 8 percent, and 5 percent respectively?—?compared to 19 percent, 6 percent, and 7 percent for Lyft. All of those numbers shrink considerably for tech and leadership roles. At Lyft, only 18 percent and 13 percent of its tech staff and leadership respectively are women. There are no black people in tech leadership roles while Latinx leaders make up just 4 percent. Thirty-four percent of tech leaders at Lyft are Asian while the remainder, 59 percent, are white. In a blog post releasing the inaugural report, Lyft said releasing diversity data will help keep the company accountable. [W]e have a lot of work to do. Releasing our data will hold us accountable, but it’s the actions we take that will make a difference to the people who come to work every day at Lyft. Our diversity data exposes gaps in important areas. So we’re doing something about it. The diversity report comes on the heels of Uber’s, which released its numbers following a massive sexual harassment scandal earlier this year. Lyft hasn’t had such a scandal but its numbers, which can be improved all around, suggest that it’s doing much better on gender representation than race and ethnicity. Tech companies in general, however, have struggled to improve their diversity numbers in spite of releasing transparency reports. For example, Apple has previously called improving diversity “unduly burdensome” and recently shot down a proposal to diversify its all-white board led by CEO Tim Cook. Even Google, which started the diversity report trend in 2014, hasn’t been able to solve its race and gender diversity?—?and retention?—?problems. Along with the its diversity report, Lyft mentioned its hiring of Tariq Meyers, formerly the company’s community organizer, in 2016 to lead its diversity and inclusion efforts as well as its partnership with the diversity strategy firm Paradigm. This article was originally published at ThinkProgress on June 1, 2017. Reprinted with permission. 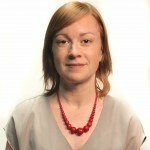 About the Author: Lauren Williams is a tech reporter at ThinkProgress. According to a new report from the Economic Policy Institute, creating an economy that works for everyone starts with creating an economy that works for women. There’s good news and bad news. 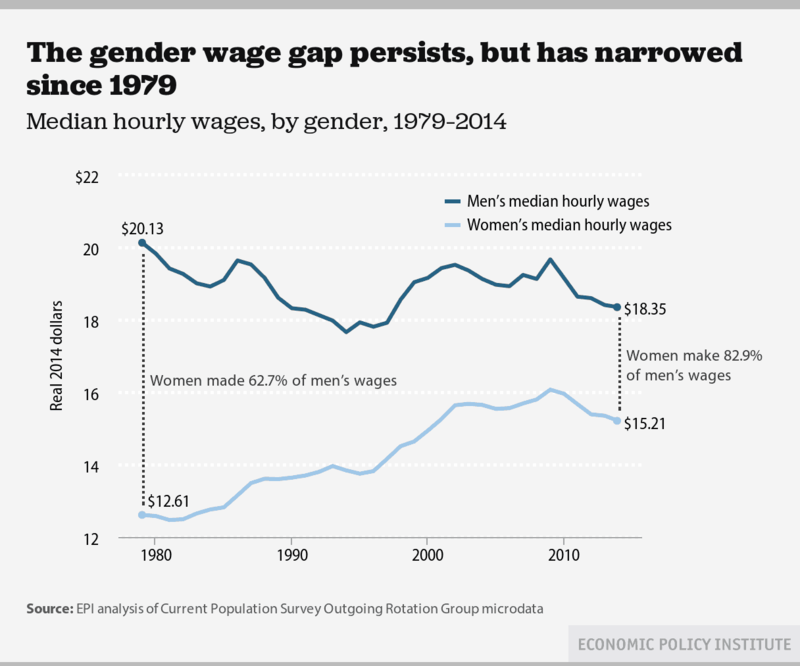 The good news is that the gap between women’s earnings and men’s earnings has closed a little. The bad news is the narrowing of the gender wage gap is not due to women’s gains in the workplace, but to declining wages for men and growing inequality overall. 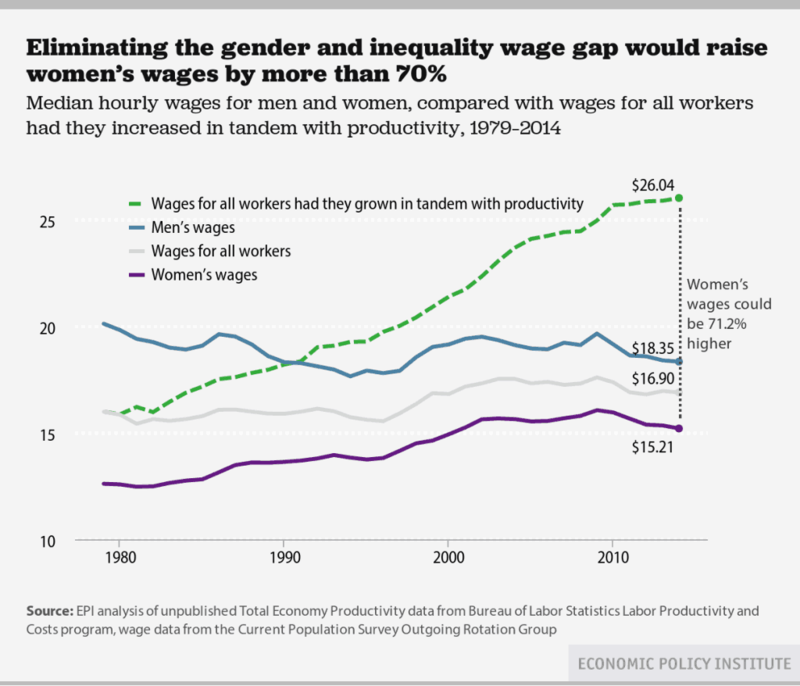 According to a recent report from the Economic Policy Institute (EPI), eliminating the gap between men’s and women’s wages would amount to a 70% raise for women. Consider economic impact of eliminating the gender pay gap. Women are the primary breadwinners in at least 40 percent of American households. Consider what eliminating the gender pay gap would mean for these women. Nearly 60 percent of women would earn more if working women were paid the same as men the same age doing similar work. The poverty rate for working women would be cut in half; the poverty rate for working single mothers would fall by nearly half. 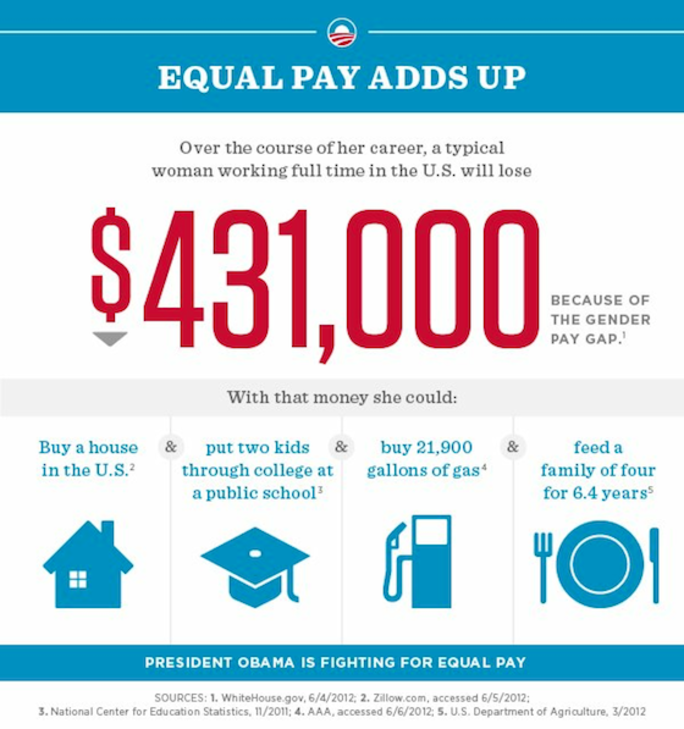 The US Economy would produce an extra $447.6 billion, if women received equal pay. The benefits for women are clear. As I wrote in, “We Must Fight Poverty With Justice,” it’s no coincidence that women’s risk of poverty jumps drastically between the ages of 25 and 34, when their poverty rate is 6.9 times higher than men’s, or that their poverty risk doesn’t begin to come down until age 40. Women are at a higher risk of poverty during their peak reproductive years, when they begin juggling the responsibilities of work and family, and lose out on pay that’s already less than what men earn. However, the benefits of the agenda aren’t exclusive to women. In fact, none of its 12 points are applied exclusively to women. Men, women, and children would benefit from increased wages, guaranteed family leave and paid sick leave, accessible child care, and all of the other agenda items. 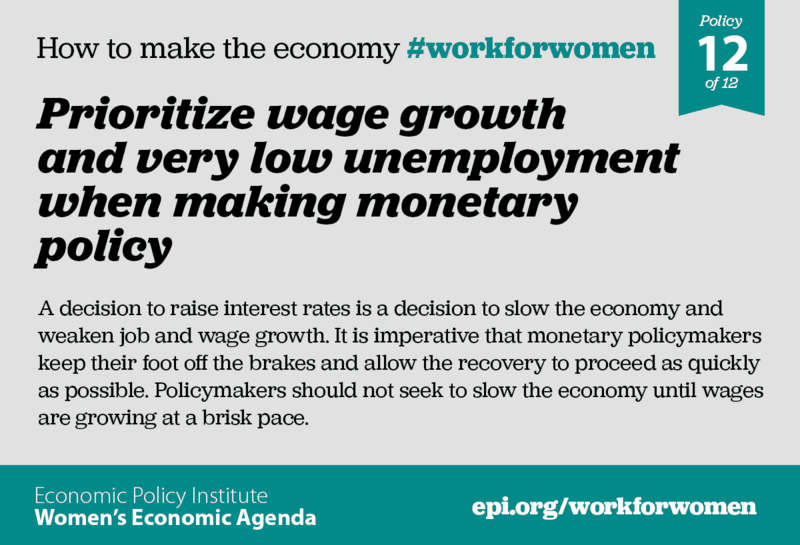 When the economy works for women on these 12 issues, it’s more likely to work for us all. This blog was originally posted on Our Future on November 18, 2015. Reprinted with permission. About the Author: Terrance Heath is the Online Producer at Campaign for America’s Future. He has consulted on blogging and social media consultant for a number of organizations and agencies. 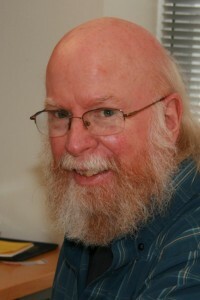 He is a prominent activist on LGBT and HIV/AIDS issues. There’s a stereotype of union members as, well, men. You know: The sweat-stained, blue-collar guy toiling at the construction site, or sweating in a factory. To be sure, it’s a stereotype that’s grounded in reality. Historically, unions have been a powerful conduit that enabled blue-collar men to enter and then build the American middle class. Labor unions succeeded in limiting their working hours, improving the safety of their workplaces, and raising their pay. But that’s only a small piece of the overall union movement.Take women, for example. In 2014, women made up 45.5 percent of all union members, up from 33.6 percent in 1984, according to a new report on women in unions from the Institute for Women’s Policy Research. And being a union member can make a big difference for women, raising wages and shrinking the gender wage gap. Keep reading below to see just how stark these differences can be. Among full-time workers ages 16 and older, women represented by labor unions earn an average of $212, or 30.9 percent, more per week than women in nonunion jobs (Figure 1). Men of the same age range who are represented by unions earn, on average, $173, or 20.6 percent, more per week than those without union representation (U.S. Bureau of Labor Statistics 2015c). Earnings data in this section are not controlled for age, education, or industry; when controlled for these factors, the union advantage is smaller but still significant, especially for women and minorities (Jones, Schmitt, and Woo 2014). Union women experience a smaller gender wage gap. Women who are represented by labor unions earn 88.7 cents on the dollar compared with their male counterparts, a considerably higher earnings ratio than the earnings ratio between all women and men in the United States (U.S. Bureau of Labor Statistics 2015c). Women of all major racial and ethnic groups experience a union wage advantage. The difference in earnings between those with and without union representation is largest for Hispanic workers. Hispanic women represented by labor unions have median weekly earnings that are 42.1 percent higher than those without union representation. Hispanic men with union representation have earnings that are 40.6 percent higher than their nonunion counterparts. Women represented by a union are also more likely to get health insurance and a pension. The overall effect is that unions are helping to lift women into financial security and move workplaces toward equality, just as they helped create the middle class during the 20th century. It’s one more thing to think about as we continue to watch Republicans attack unions and everything they stand for. This blog was originally posted on Daily Kos on September 7th, 2015. Reprinted with permission. Shelly Kapoor Collins had spent more than 10 decades in technology, but she felt that something was still missing from her career. 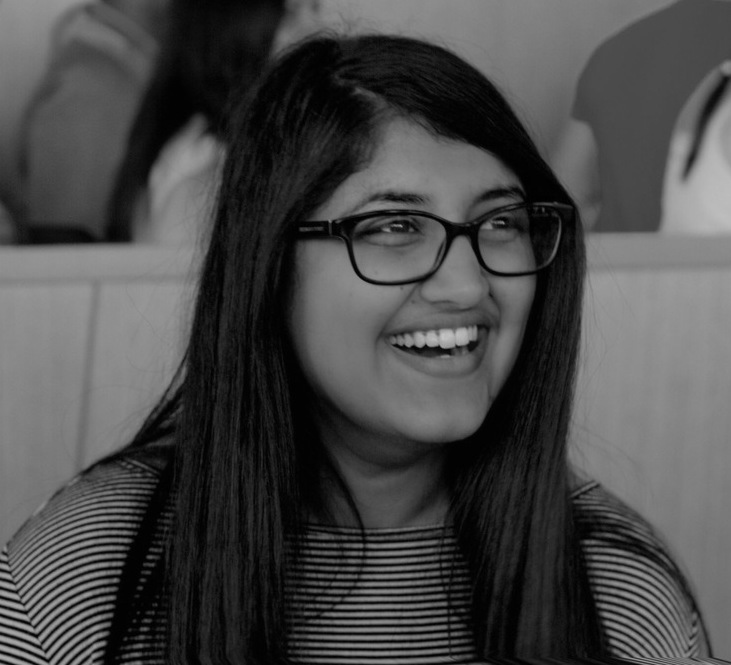 “I knew that I loved tech, but I never quite understood the concept of working for someone else,” she said. And eventually, the mother of a 10-month-old daughter who was pregnant with a son got sick of waiting for the right time to branch out on her own. So she decided to go ahead and launch her company, Enscient Corporation. And she couldn’t be happier. It seems that a lot of American women have decided that it is their time to take the same dive. According to an analysis of new data on business creation from the Census Bureau conducted by the National Women’s Business Council, woman-owned businesses increased 27.5 percent between 2007 and 2012, adding 2.1 million to the total, outpacing the growth the 20 percent growth they saw in the five years before that. Women now run more than 36 percent of all businesses (that aren’t farms), up from just under 30 percent in 2007. Businesses owned by men, meanwhile, just puttered along. They grew less than 6 percent between 2002 and 2007 and less than 8 percent between 2007 and 2012. And companies run by women now employ 8.9 million people. In fact, the number of people working for a woman-owned business increased 19.5 percent, while it only increased 11.5 percent for those run by men. The increases are even more dramatic for businesses started by women of color like Kapoor Collins, who is Indian American. Businesses owned by black women increased 67.5 percent between 2007 and 2012, versus less than 19 percent growth for those started by black men. Nearly 60 percent of all businesses run by a black person are now run by women. Hispanic women saw an even bigger gain, as their businesses increased more than 87 percent in the same time period compared to about 39 percent growth for Hispanic men. And those run by Asian American women grew 44 percent, compared to 25 percent for Asian American men. Of course there are still far more companies run by men. The total came to nearly 15 million as of 2012, compared to 9.9 million owned by women. And money can be a concern. Kapoor Collins has experienced funding hurdles firsthand. When she decided to launch a new product that helps politicians and nonprofits fundraise, she needed funding herself to get it up and running. Two things got in her way, though: one is the time demand of fundraising for someone with young children, and the other was plain sexism. “Men give to men, they raise from each other and give to each other,” she said. “It’s an old boys’ network. As a woman, it’s hard to tap into that.” In the end she decided to have her company fund the project itself. It’s a well-known problem that women struggle to raise money. They only net 13 percent of of venture capital funding and get less than 5 percent of government contracts. Business school students are four times more likely to recommend investing in a company led by a man, something that holds true even with the exact same pitch. And once they get up and running, women’s businesses can struggle to bring in the big bucks. The vast majority of companies they own bring in less than $25,000 in receipts and companies that size saw the highest rate of growth. Just 1.8 percent make it past the $1 million revenue mark, compared to 6.3 percent owned by men. And her message to any woman who might be considering making that move herself: jump in. “The worst thing you can do is to not do it,” she said. This blog originally appeared at ThinkProgress.org on August 20, 2015. Reprinted with permission. Today, Equal Pay Day, marks the day when women workers close the 2014 pay gap, and that wage gap is huge. Women, on average, earn 78 cents on the dollar compared to men’s wages and that adds up to more than $10,800 a year and more than $400,000 over a career. A new report finds that wage gap is even wider for mothers, especially single mothers and mothers of color, most of whom are essential breadwinners and caregivers for their families. The report, An Unlevel Playing Field: America’s Gender-Based Wage Gap, Binds of Discrimination and a Path Forward, by the National Partnership for Women & Families, finds mothers who work full-time, year-round in the United States are paid just 71 cents for every dollar paid to fathers who work full-time, year-round. Single mothers are paid just 58 cents for every dollar paid to fathers. And African American and Latina mothers suffer the biggest disparities, being paid just 54 cents and 49 cents, respectively, for every dollar paid to white, non-Hispanic fathers. In 2009, Congress passed and President Barack Obama signed the Lilly Ledbetter Fair Pay Act, which overturned a 2007 U.S. Supreme Court ruling that denied many pay discrimination victims their day in court. But since then, Republican lawmakers have blocked votes on the Paycheck Fairness Act. That legislation would strengthen penalties that courts may impose for equal pay violations and prohibit retaliation against workers who inquire about or disclose information about employers’ wage practices. The bill also would require employers to show pay disparity is truly related to job performance—not gender. Last April, President Obama signed two executive orders on equal pay, one that banned retaliation against employees of federal contractors for discussing their wages and another that instructed the U.S. Department of Labor to create new regulations requiring federal contractors to submit data on employee compensation. While these actions will help federal contractor employees, congressional action is needed to end gender-based pay discrimination for all workers. 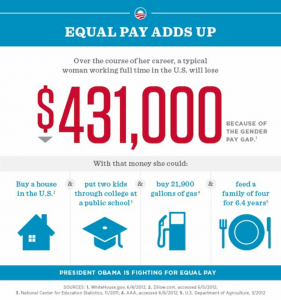 Here are some other facts on unequal pay and the wage gap between men and women. If the pay trends of the past five decades remain the same, it will take nearly another five decades—until 2058—for women to reach pay equity with men. If women and men received equal pay, the poverty rate for all working women and their families would be cut in half from 8.1% to 3.9%. The gender wage gap among union members is half the size of the wage gap among nonunion workers. Union women working full-time earn, on average, 90.6% of what their male peers earn. The wage gap for union members fell 2.6 cents between 2012 and 2013 but was virtually unchanged for nonunion workers. Paying women the same wage as their male peers would have added an additional $448 billion to the economy in 2012 or roughly 3% of the country’s GDP. 62% of women who work in the private sector report that discussing pay at work is strongly discouraged or prohibited, making it harder for women to discover if they are missing out on wages they deserve. Requiring employers to disclose employee pay rankings would allow women to know if they are being paid the same wage as comparable workers. This article was originally printed on AFL-CIO on April 14, 2015. Reprinted with permission. Is Transparency The Tool Women Need to Revolutionize Their Workplaces? The United States is one of just three countries in the world that doesn’t require paid maternity leave. Just 12 percent of people who work in the private sector are offered paid family leave. That’s one of many major hurdles women, particularly mothers, face in the workplace. But women make up half of the labor force. So what can be done to change that picture so that they aren’t so often stuck between a rock and a hard place? Two new websites have one answer: transparency. Ursula Mead is a self-described working mom and “data geek.” “I come from an area where data can really help you make good decisions and help you understand situations,” she explained. That’s because Seltzer says she’s seen many friends’ careers derailed by workplaces that couldn’t accommodate their needs. “I think some women are changing their career options based on things like how family-friendly their workplace is rather than just what the best fit for them might be,” she said. “If there was more transparency, at least it would help people make informed decisions.” She also noted that being able to compare a particular company to the others tagged in the same industry can be useful. “That can actually give you leverage,” she said, to get a company to consider more generous benefits if peers are already doing the same. Mead hopes InHerSight will give women a way to pick the right workplaces for their needs. Part of the mission is to “help women find what they’re looking for and improve what they get” at work, she said. She thinks women themselves are best able to articulate what they need as well as what’s actually happening inside a given company. “I’m giving them that platform,” she said. She also thinks it will be useful to employers. “I think it’s in companies’ interests to figure out what they need to do to attract and retain that top female talent,” she said. “Companies could use this as a starting point for an action plan for themselves.” The website can certainly point out when a company’s policies are simply lacking. But it can get more nuanced metrics around those it already has about how comfortable female employees feel using them. Some companies have even told Mead they want to send the site to their employees to gather ratings. “They’re essentially saying that they are going to own these numbers and they want to be held accountable for them,” she noted. Seltzer and Clark they also think that companies can respond to their anonymous data. “One person emailed me saying she works at a new company and they’re going to use one of the entries on our site to help model their policy because they think it’s good,” Seltzer noted. Both websites recognize that men are increasingly interested in figuring work/life balance out as well. “I would love for men to open up their company handbooks,” Clark said. She noted that male friends have looked at their companies’ policies and realized that “things were written very clearly for new mothers or adoptive parents,” not necessarily new dads. Both sites are new and will be most effective if they reach a larger scale. Mead says she is focused right now on getting more ratings, and while the site has thousands, she wants to take it to the hundreds of thousands. More data will mean deeper insights, such as being able to benchmark a company profile against others in the same industry or of the same size. She and her team are also working on rolling out new tools, such as seeing how the ratings on each metric vary for a given company. If a company gets a bunch of fives and ones on a given aspect, that may show something different than everyone giving threes, like perhaps using a policy “depends on your manager or your department or experiences across the company are varying widely,” she said. Having It Some is also looking for more submissions, but has about 40 at the moment. “We have some good variety,” Seltzer noted. The work both sites are trying to do is urgent. The United States used to beat other developed countries in our share of working women, but we’ve recentlybeen falling behind because of our lack of family-friendly policies. Meanwhile, women face discrimination or even termination for talking about their pregnancies or asking for changes to company policy. “We shouldn’t be working in an environment where a woman feels uncomfortable asking about a parental leave policy in a job interview,” Clark noted. Armed with data from these websites, women may have more options. This article originally appeared in thinkprogress.org on March 26, 2015. Reprinted with permission.